I see a lot of laptops come through my door and many of them try to impress with fancy sculpted cases and LED lighting effects. Granted, looking hot does get some points upfront, but after trying out my third Eurocom laptop in the past few years —this time the Shark 2— I’ve really come to appreciate this manufacturer’s approach. While the Shark 2 doesn’t look cheap, it is understated compared to many laptops aimed at the gaming and graphics professional crowd. It’s also a solid performer with a good display, high quality sound, a powerful Intel Haswell CPU and an NVIDIA GeForce GTX 765M graphics card for gaming. While having a dedicated graphics card adds some punch for gaming, the Shark 2 also packs a pretty serious CPU in the Intel Core i7. Between the two, you’re covered for pretty much anything you’d want to do with a portable PC, from crunching numbers in Excel to editing multimedia files. For many users, expandability is a concern, especially in a laptop. Whether you happen to be a professional user who needs to edit video, a gamer with multiple installs or someone amassing a collection of digital video, photos or music, you can never have enough storage. While the Eurocom Shark 2 came with nearly 1TB of usable storage —plenty for the average user— one of the advantages of its larger form factor becomes readily apparent when you look at expansion. In addition to the standard hard drive and optical drive, there are two more SATA-3 drive bays available should you need to install another drive or two. Speaking of expansion, although it sips with an ample 8GB of RAM, the Shark 2 has 3 RAM sockets with support for up to 24GB of RAM. 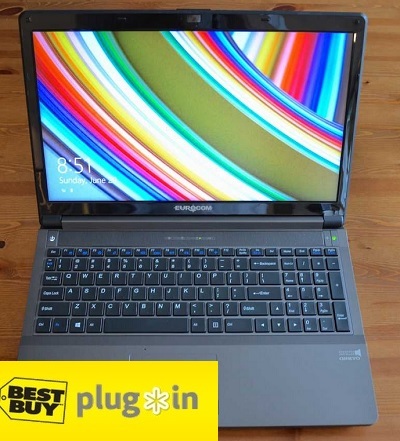 Best Buy carries a huge range of Eurocom high performance laptops —two dozen, in fact! Within this group there’s something for virtually any need or budget, from the 11.6-inch Monster to the blistering performance of the 17.3-inch Scorpius 3D. Based on the pattern of performance and value for the dollar I’ve seen through hands on time with three different models —the Monster, the M3 and now the Shark 2— I think Eurocom should be on your list any time you’re considering a new gaming laptop, or a high performance portable PC for number crunching, graphic processing or any other task that needs power and performance. 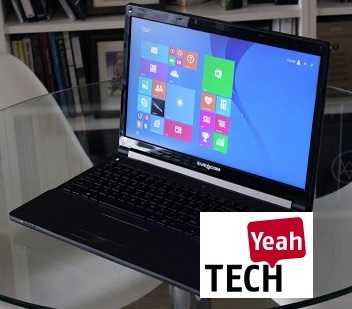 There are flashier looking laptops out there, but not many that offer better bang for the buck. Eurocom isn’t quite the most commonly talked about name in notebooks that I hear. There are certainly more common brands out there. That’s a shame, because every Eurocom notebook I take for a spin, I like even more than the last. The performance, quality, and attention to detail of their notebooks make them formidable machines, when compared against other notebooks out there, or even available desktop PCs. The latest Eurocom PC I’ve been spending time with has been their Shark 2 which has plenty of horsepower under the hood to satisfy any gamer looking to break free of their desk. Overall I really like this machine and can highly recommend it to anybody looking to combine mobility with a very high level of performance. If you’re a PC gamer, or looking to crunch through lots of HD video files, work on 3D renderings or any other similarly power-hungry applications, this machine will work wonders. Do you know someone who still thinks they need a desktop PC? 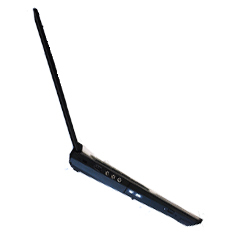 Show them the Eurocom Shark 2. Once they take a good look at what this machine can offer in a mobile form-factor they’ll start to reconsider their love affair with desktop PCs. The Eurocom Shark 2 Gaming laptop has a phenomenal balance of performance and mobility without breaking the bank. Top that off with the tremendous upgradability of this machine and it's hard not to recommend it. It’s well built, has snappy performance, and is scalable for your future needs. This is truly a machine that can replace your desktop PC. + Case does not get hot almost at all. Goldmax Shark 2.0 není nijak zvlášť drahý, tlustý, žravý ani těžký. Je to jen taková obyčejná patnáctka s nadmíru slušným herním výkonem. Nová GeForce GTX 765M sice zdaleka nepatří k nejsilnějším grafikám na trhu, ale necelé dva roky starý highend zdařile dorovnává.